If you are a facilities manager or business owner looking to cut down on the square footage requirements of your office, you’re no doubt familiar with the terms “hoteling” and “hot-desking”. In these arrangements, workers don’t get a permanently assigned desk or workstation of their own. Instead, employees pick a station on a first come, first serve basis. Or, they check in and get assigned a desk that’s available. This approach has a few advantages. 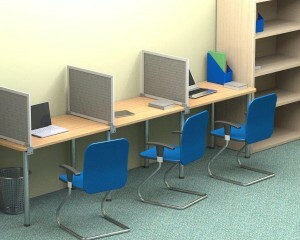 Some employers are able to cut down dramatically on the number of workstations required for their staff. This works particularly well in situations where many employees have flexible work schedules and/or telecommute. They aren’t as likely to feel put out that they don’t get their “own” desk. Plus, the odds of all your workers being in the office at the same time aren’t high. This means that if you have 100 employees, you might figure out that you need only 60 workstations to serve everyone on an average workday. The details vary and not every office culture is a good match for hot-desking (you can get more great information about the pros and cons here). Taking away an employee’s sense of “ownership” over their workspace shouldn’t mean taking away their sense of privacy. As you reduce the footprint of your office with hot-desking, noise and visual distractions become even more of a concern. Adding privacy panels can help reduce the sound level and give workers a greater chance to concentrate. What if far more employees show up than you have desks for? Add more spaces at a moment’s notice by installing desktop dividers cross-wise along any flat worksurface. You could turn a conference table or a long table-style worktop into multiple “work pods” in minutes. If everyone’s using laptops anyway, they don’t necessarily need a lot of surface area.